COLUMBIA, Mo 10/23/14 (Interview) -- A 12-year-old boy, whose family was forced to move from their long-time Columbia home after a slew of property tax increases, has been thrust into the debate over one of the biggest property tax increases in years: Mayor Bob McDavid's citywide tax hike to fund "public safety". 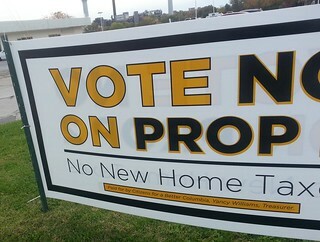 Known as Proposition 1, it reads on the November 4 ballot, "Shall the City of Columbia, Missouri increase the general property tax rate of the City by $0.30 per $100.00 of assessed valuation for the sole purpose of funding an increase in police and fire departments?" 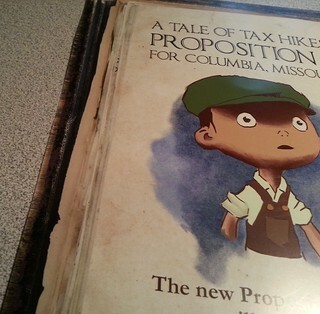 A cartoon-rendering of the boy appeared this week on a widely-distributed flyer that tells a cautionary "Tale of Tax Hikes." CLICK PIX FOR LARGER IMAGES. Taken from a self-published book aimed at kids about how high property taxes are hurting real estate -- battered mercilessly during the 2008 recession -- the flyer accurately depicts the child as nearly destitute. Boone County Assessor Tom Schauwecker had a choice -- reassess the city's largest developers, who are notoriously undertaxed; or reassess the boy's family home, to comply with several school and other levies. Sadly for the child, the County Assessor chose the latter. "Our property taxes almost tripled," the boy -- who asked to remain anonymous for fear of "assessination" -- told the Heart Beat in an exclusive interview. 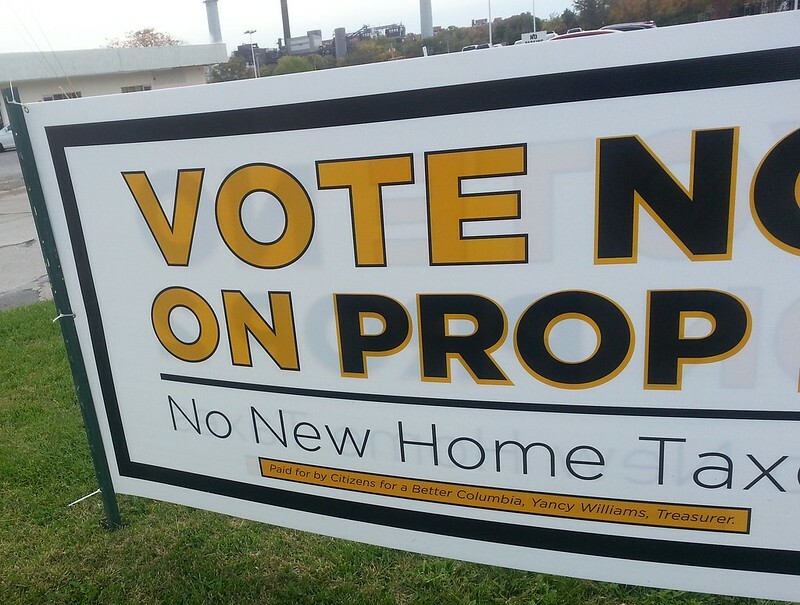 Since we sat down last week to discuss his family's plight, signs have appeared on property owned by developer Stan Kroenke that also decry "new taxes on homes." Kroenke -- who some say feels guilty about his ultra-cushy property tax situation -- reportedly agreed to help the child "get word out about this terrible scourge," the boy explained. "Mr. Kroenke pays so little on all his properties that he felt he could afford to help us, and we do so much appreciate his kindness." Dr. McDavid and city manager Mike Matthes claim the property tax hike will hire more police and firefighters. 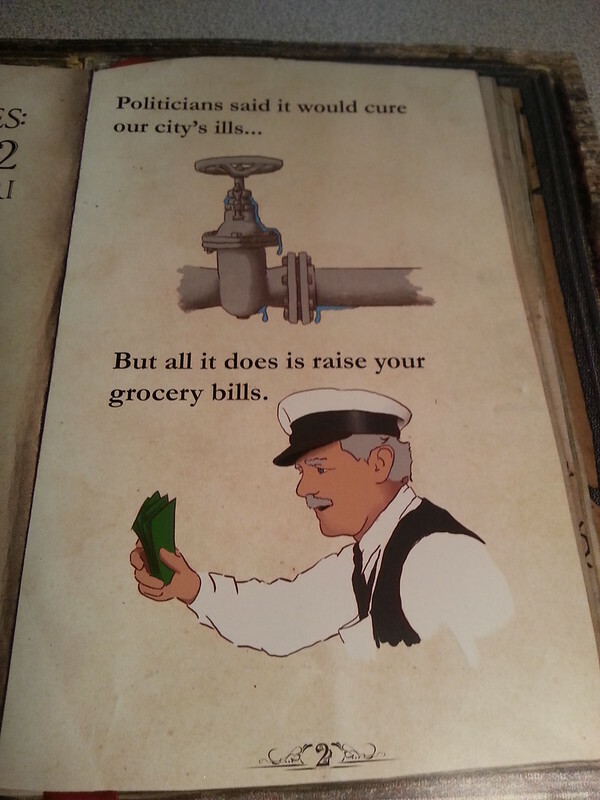 "Politicians said it would cure our city's ills," the flyer explains (left). "But all it does is raise your grocery bills." The boy explained th e reasoning behind the flyer's dire message. "Mr. Kroenke says if the property tax hike passes, he will have to raise the rent on Lucky's Market because he owns the building," the boy explained. "Lucky's will then have to raise their grocery prices to pass the cost on to their...hungry...customers." Nearly in tears, the boy recalled the many times he and his little sister Nell went hungry. "After our property taxes almost tripled, that's all my father could afford to pay," the boy said. The flyer's second page caused the child to sigh in grief. "It tells our story exactly," he said. "How high property taxes hurt low-income neighborhoods. 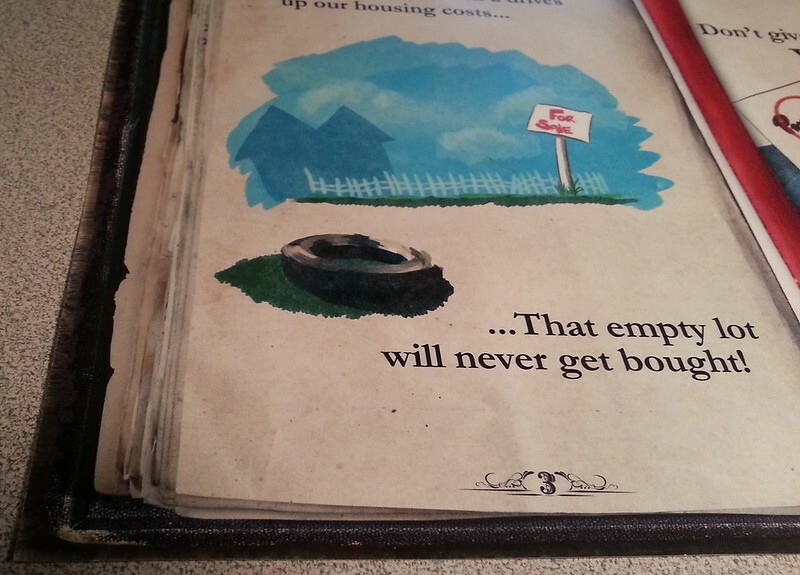 How they make it unaffordable to own a home, especially for low-income people." The vacant lot depicted on the flyer is from a photograph on the boy's street. "I used to play with that tire," he says. "I had a little tire swing in our back yard." Overcome with emotion, the boy gathered himself just long enough to thank the community ahead of time for voting NO on what critics are calling a "jobs-killing tax on our homes". "Mayor McDavid should be ashamed of himself," the boy said. "Keeping property taxes down helps keep crime down, too. It helps keep people working. And keeps families like mine in their homes." Shall the City of Columbia, Missouri increase the general property tax rate of the City by $0.30 per $100.00 of assessed valuation for the sole purpose of funding an increase in staffing and operations of the police and fire departments of the City? If authorized by the voters, the increase in the general property tax rate received by the City of Columbia, Missouri shall be segregated from the other general property tax revenues. Because timely information can rally voices, change minds, and save communities.